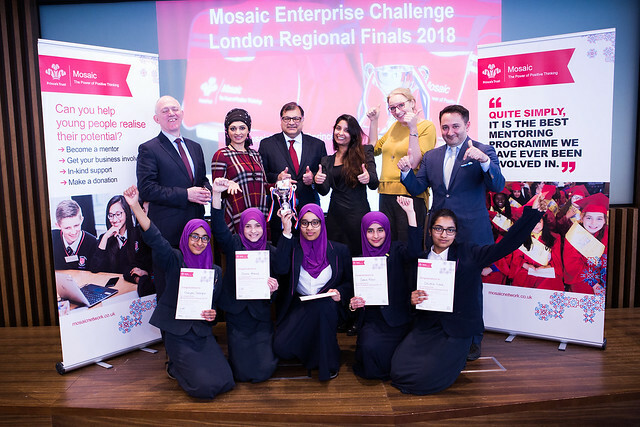 A young team of young aspiring entrepreneurs from Eden Girls, Waltham Forest have won the London Regional Final of our 2018 Mosaic Enterprise Challenge competition. 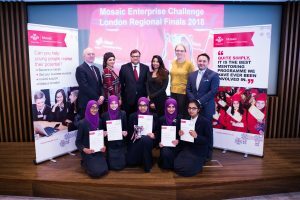 Having beaten others within their region and teams from Crest Academy, Little Ilford School, Mulberry Girls School, and Westminster Academy, Eden Girls Team ‘Edwise’ beat off the competition with their idea for an app which would revolutionise how supply teachers are sourced in schools. The teams pitched their ideas to a panel of highly acclaimed judges: James McAleenan, Non Executive Director at The Holley Holland Group, Dr Haseena Lockhat – Chairman Mosaic West Midlands RLG, Rosalind Wall – Deputy Director of Industrial Strategy at BEIS and Shegufta Rahman – Grants Officer at City Bridge Trust, who were lead by the Chair of Judges, Habib Motani – Partner at Clifford Chance. Team Edwise now enter the final stage of the competition, progressing to the Enterprise Challenge Grand Finals in London on the 8th May. Here they will go on to compete against all other winning schools from respective regions including the North West, West Midlands, Yorkshire, Glasgow and London for the chance to become the national champions 2018. The overall winning team will win a prize of £2,500 for their school plus a further £500 to invest in developing their business idea and making it a commercial reality. Previous winners have also enjoyed tea at 10 Downing Street and a unique tour of Clarence House.